Agra Jaipur Ajmer tour by train is a great option to explore three biggest city of Northern India. Get ready to experience the royal train journey with the Indian Railway - most pleasant mode of travelling through India and magnificent hotels on wheels with five-star services and Indian rail Passes. We offering you the best train tour travel packages and reservation services throughout India. Duration : 6 Nights – 7 Days with Hotels & travel by Air Conditioned Train & Car with Personal Driver For the below trip. Namaste! Today you will arrive at the Indira Gandhi International Airport in New Delhi. A Friends Travel Services representative will be waiting for you with a sign bearing your name. You are then driven to your hotel where you are assisted with your check in. Stay overnight at the hotel in Delhi. (In case of any difficulty in finding our representative, you can call us at +919818243600). Day 2 : Delhi City Tourwith Personal car & Driver. 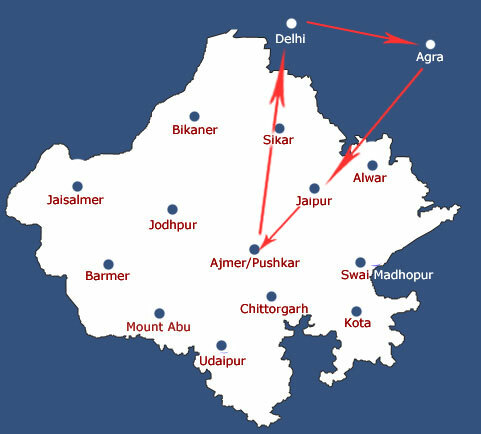 Day 6 : Jaipur to Ajmer by Train Pick up & Transfer to Ajmer. This morning after breakfast you will be transferred to Jaipur railway station to board the train to Ajmer. On arrival at Ajmer railways station, our representative will meet you to pick you up and transfer to your hotel. By Afternoon you will visit the Ajmer Dargah Khwaja Sahib, one of the holiest Muslim shrines in the country by evening retrun to your hotel.Stay overnight at Ajmer. Day 7 : Ajmer to Delhi by Train & transfer to Airport for your onward Journey This morning after breakfast you may visit Again Ajmer Dargah Khwaja Sahib one of the holiest Muslim shrines in the country. By afternoon you will be transferred to Ajmer railway station to board the train to Delhi. On arrival at Delhi Railway Station, our representative will meet your & transfer you to hotel in Delhi OR to Airport for your onward Journey. All arrival, departure, sightseeing's as per above itinerary by Air-condition tourist car in Delhi, Agra, Jaipur, Ajmer, Delhi As per the above tour. Train tickets Delhi, Agra, Jaipur, Ajmer, Delhi By air-condition Trains. Guide Services in Agra, Jaipur & Ajmer.